On Apr. 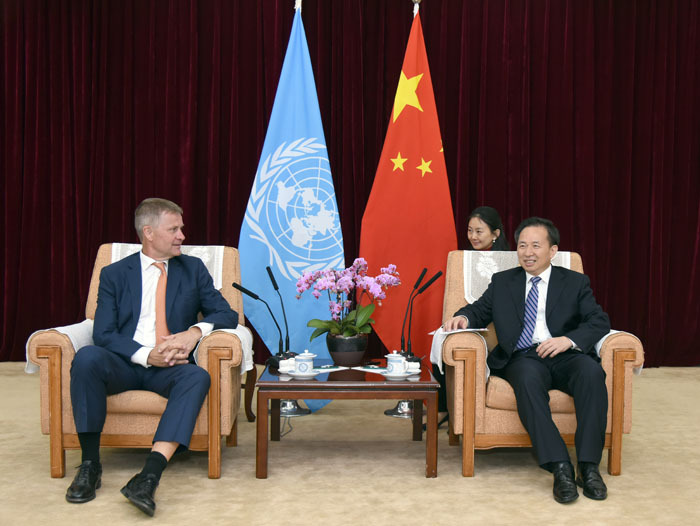 17, Minister Li Ganjie met with UN Deputy Director General and UNEP Executive Director Erik Solheim in Beijing. The two sides had in-depth exchanges on the bilateral ecological and environmental protection. Minister Li extended warm welcome to the delegation headed by Mr. Solheim. He held that the two sides have had profound and frequent interactions and communications on a wide range of topics since Mr. Solheim took the helm of UNEP. The bilateral cooperation, which has been conducted in more areas and at higher levels, has been very fruitful. The newly established Ministry of Ecology and Environment unveiled its plate yesterday, said Li. The new ministry came with the restructuring plan of the Chinese Government, by integrating the original functions of the former Ministry of Environmental Protection with relevant functions of six other State departments. The ecological and environmental protection functions that were scattered across the Cabinet are integrated, and the new ministry will oversee the ecological conservation and the pollution emission in urban and rural areas and conduct compliance inspection. This is a major decision made by the CPC Central Committee with Comrade Xi Jinping at its core and will be of great significance to promoting ecological progress, safeguarding national ecological security, and building a beautiful China. The main objective of China’s ecological and environmental protection in three years from now is to secure a victory in the fight against pollution, stressed Li. We will wage seven wars which are of milestone significance to make sure to meet this objective and lay a solid environmental foundation for securing a decisive victory in completing the building of a moderately prosperous society in all aspects. To be specific, the seven wars mean we will win the fight to defend blue skies and put up tough fights in the treatment of the black and odorous waters in the urban areas, in the integrated environmental management of Bohai Sea, the protection and restoration of the Yangtze River, the protection of source waters, and the control of pollution in the agricultural sector and rural areas. The two sides also had discussions on the establishment of China-Africa Environmental Cooperation Center, the international coalition for green development on the Belt and Road, and the UNEP-CCICED cooperation. Mr. Solheim congratulated Minister Li on the establishment of the Ministry of Ecology and Environment and spoke highly of China’s enormous endeavors and notable achievements in the ecological and environmental protection. He fully recognized China’s positive role in global environmental protection and sustainable development, and would like to continue to support China’s ecological and environmental protection based on previous cooperation.